All hail and welcome to "The Gods Are Bored!" Today is Imbolc, the lambing season, when all the candles are kindled and all the faithful stay home to freshen their hearths! Now I do truly hope Queen Brighid the Bright will forgive me, but I must squirrel away the sick days I will actually be compensated for. This will be the final Imbolc that finds me healthy enough to work, so Goddess ... please understand. I had to go to work today. My religious holidays are not recognized by the state of New Jersey, and my compensated sick time ends with June 2017. My home and hearth has been tense since November 9 and especially since January 20. Tempers are short and anxieties high. Every night brings a new and alarming report. If that isn't bad enough, I have the unfortunate habit of reading Yahoo comments. Today I saw a little note from someone who wants to shoot and bury all "libtards." Yes. Shoot and bury. Although I feel extremely unworthy, I will still petition the Goddess to preserve my home and hearth, to restore what passes for balance in this environment, to keep minds easy -- including mine. Imbolc is a good moment to reflect that at least we have seasons, that the darkness can diminish in the sky, if not in the headlines. This is the moment between solstice and equinox, rolling toward a new growing season. Let's light the candles, it'll be all right. Light the candles, it'll be all right. every time we RESIST, we light a candle against the darkness. I'm thoroughly enjoying your posts, however I am sorry you're not feeling well. I get that, both my husband and I and pretty much everyone we know has been ill this winter. I think the stress created by the Orange Foolius is getting to us. Take care and keep resisting, you're not alone! Imbolc blessings to you, Anne. Stop reading Yahoo comments. "libtards" Just when I thought I'd heard all the insults. This is a new one for me. 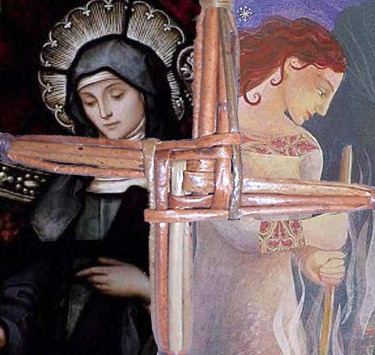 Wishing you a serene Imbolc. My work also doesn't recognize the true holidays, so we celebrate surreptitiously. The days are getting longer, the nights shorter. We've got to hold on to that! Light will return, and maybe even shine on us one day. Also, I agree with Anne Marie about resisting. And with Debra - don't read the comments! And here I was thinking that the groundhog had some kind of control over the seasons.